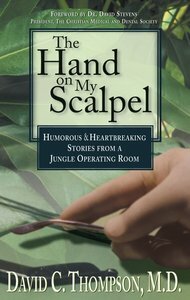 This is not just a book about surgery. It is not even just about surgery in a remote jungle station. It is about God and His unpredictable working in the life and ministry of a missionary kid from Cambodia who ends up as a medical doctor at an isolated hospital in Gabon, West Africa. You will laugh when a "simple" outhouse building project turns into a comedy of errors. You will cry when a pregnant, retarded and epileptic girl arrives at the hospital and gives birth to "Grace." But most of all, you will come to understand that there is a love that reaches beyond the possible to embrace the sick and the hopeless and the unlovely-God's love generously displayed by God's servants. About "The Hand on My Scalpel"
Thompson at the request of the Gabon Alliance Church, heads a medical team that maintains the Bongolo Evangelical Hospital, a nursing school and dental clinic, four outlying dispensaries and an area-wide primary health care program.